We celebrated Q’s birthday on Friday. Hard to believe that my little guy is already 7 years old. Seems like just yesterday that he was born! He’s turned into quite the little man. He is warm and loving and the best big brother, taking great care of Z. He has developed quite the palate and is a huge fan of sushi. 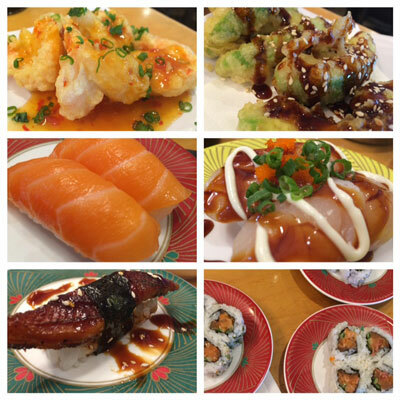 To celebrate, we went to his favourite place, Kinjo! 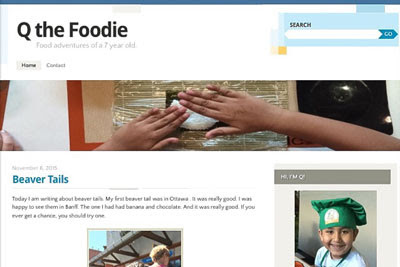 Since the summer, Q has been wanting to create his own food blog. Q the Foodie was launched on Friday and I hope that you will check it out. Q is hoping to document his food adventures. Life is busy. Our days are spent running from one activity to the next. We try and keep Sundays free, a day to spend at home and putter around the house. Sundays seem like the perfect day to have something cooking for a few hours, filling the house with aromatic smells. 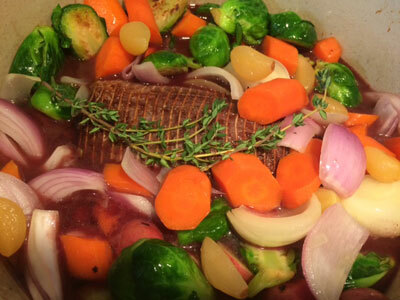 Yesterday we spent our Sunday enjoying the smells of a roast while we hung around the house. 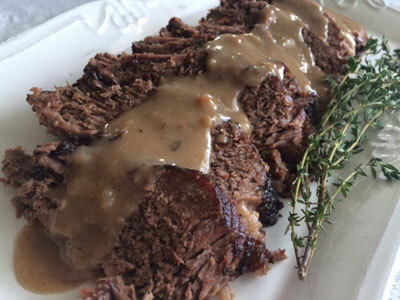 Cooked alongside lots of veggies and topped with a creamy gravy, this pot roast gives a sense of comfort. The perfect Sunday Supper. We love beef around here. 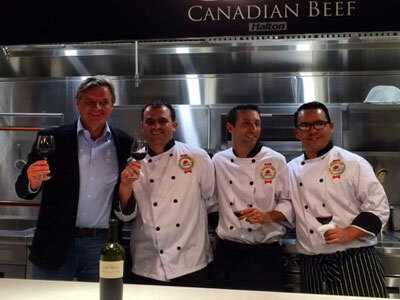 Since we love it so much, I felt I had to enter the Canadian Beef Blogger Ambassador Contest. I am up against 9 other competitors and would love your votes. Thanks for your help! Click here to vote. Preheat the oven to 300 degrees. Heat oil in a pot on the stove. Add the onions and cook for a couple minutes. Remove and place on a dish. Add the carrots and brussel sprouts. Cook until there is a bit of colour. Remove and place with the onions. Coat the roast with salt and pepper. Sear on all sides until there is a nice crust. Remove from the pan. Add one cup of red wine to deglaze the pan and scrape up all the bits. 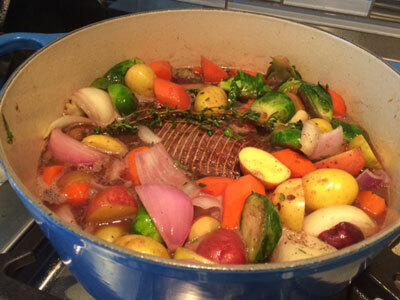 Place the roast back in along with the vegetables (including the potatoes) and cover with beef broth. Add a couple sprigs of thyme, throw in the garlic and place in the oven for approximately 3 1/2 hours. Remove the roast and cover with foil. 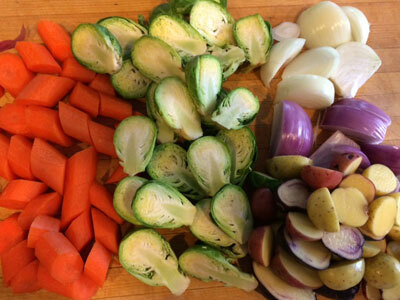 Remove the vegetables. 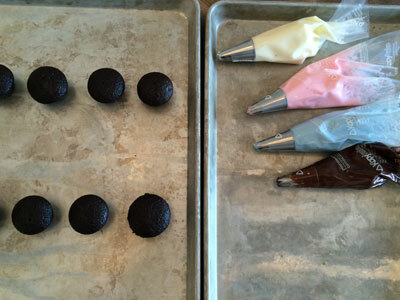 In a small pot, melt 2 TB butter and add 1/4 cup flour. Slowly add the drippings from the roast and stir until smooth. There is an exciting event going on in Alberta right now. Cook It Raw is an event taking place from October 4 to 11 and brings 14 local chefs together with 7 international chefs for a week of culinary exploration. The 21 chefs are divided into 7 teams and assigned one significant Alberta ingredient: root vegetables, bison, honey, red fife wheat, saskatoon berries, canola and beef. The local chefs include Andrew Winfield, Blair Lebsack, Brayden Kozak, Cam Dobranski, Connie DeSousa, Darren MacLean, Duncan Ly, Eden Hrabec, John Michael MacNeil, Justin Leboe, Liana Robberecht, Paul Rogalski, Scott Pohorelic and Shane Chartrand. The international chefs include Albert Adria (Spain), Amanda Cohen (USA), Brandon Baltzley (USA), Elizabeth Falkner (USA), Jamie Kennedy (CAN), JP McMahon (Ireland)Magnus Ek (Sweden), Preeti Mistri (USA) and Syrco Bakker (Netherlands). 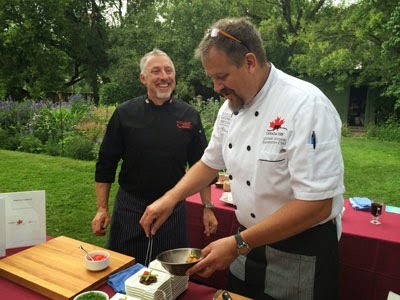 The chefs are currently in Canmore drawing inspiration from First Nations traditions with a full immersion into the landscape, customs and culinary culture of the region. From their discoveries, the will collaborate and create dishes for Feast on the Frontier. Check out the website for tickets. I was lucky to be invited to the launch party that was held on Sunday, October 4th at Model Milk. 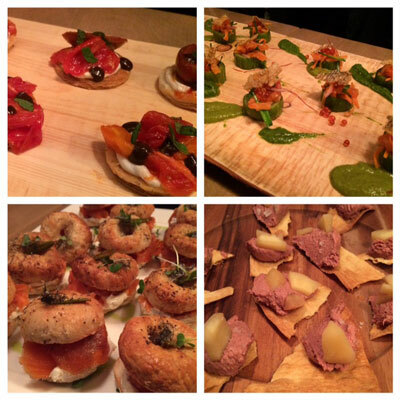 We got to meet the talented chefs and sample some delicious food. Here’s a peak at the event. 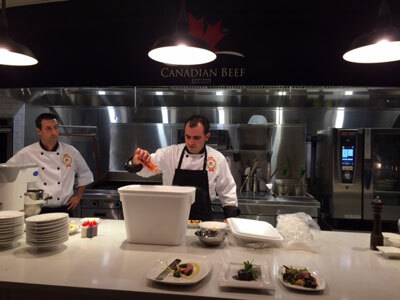 I first learned about the Canadian Beef Culinary Series last year, when I attended the Canada Beef & Karisma dinner at Rouge restaurant in Calgary. It was there that I sampled amazing beef dishes created by Chefs Allemeier and Rogalski and learned about Karisma resort. It was also there that I won a stay at the hotel in the Mayan Riviera, which turned out to be one of our favourite vacations (Part 1 | Part 2). 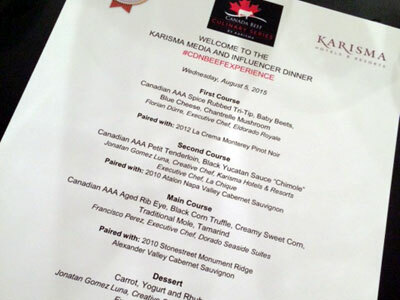 I was excited to be invited this month to the Karisma Influencer and Media event held at the new Canadian Beef Centre of Excellence which opened earlier this year in Calgary. We were fortunate to be treated to a four course meal made by the talented chefs at Karisma Hotels featuring Canada Beef. With Jeroen Hanlo, VP of Food & Beverage Operations at Karisma Hotels, the chefs kept us entertained and well fed all evening. 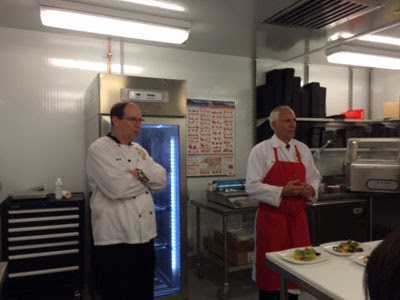 We first toured the amazing centre – fully equipped with a consumer kitchen, commercial kitchen as well as the beef fabrication room. We learned a lot from Marty Carpenter, the Centre Director and Abe van Melle, the Centre Technical Manager. 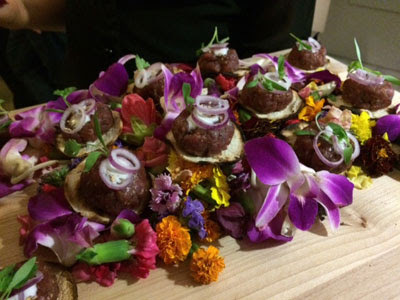 The evening started out with a tasty bite – beef tartare with habanero aioli. 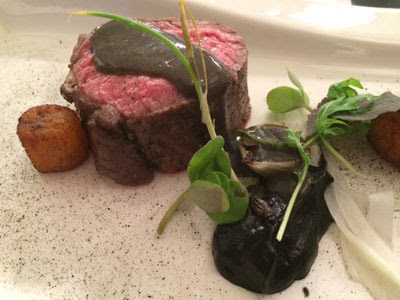 The platter was beautiful arranged with flowers and the beef was served on potato chips. 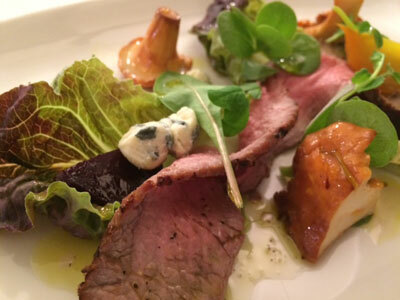 Our first course was Canadian AAA Spice Rubbed Tri-Tip, Baby Beets, Blue Cheese, Chantrelle Mushroom prepared by Chef Florian Durre, Executive Chef and Elorado Royale. 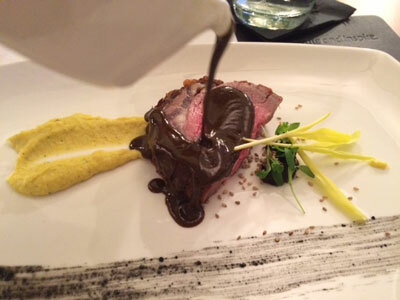 Our second course was Canadian AAA Petit Tenderloin, Yucatan Sauce “Chimole” prepared by Chef Jonaten Gomez Luna, Executive Chef at La Chique. Our main course was the Canadian AAA Aged Rib-Eye, Black Corn Truffle, Creamy Sweet Corn with Traditional Mole and Tamarind. The rib-eye was my favourite cut, soft like butter. 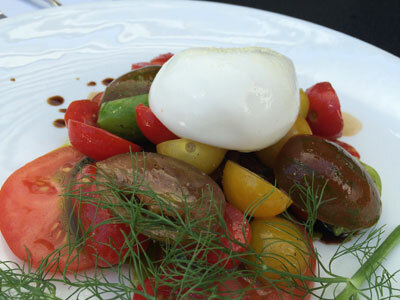 This course was prepared by Chef Francisco Perez, Executive Chef and Dorado Seaside Suites. The final course was an amazing sight. 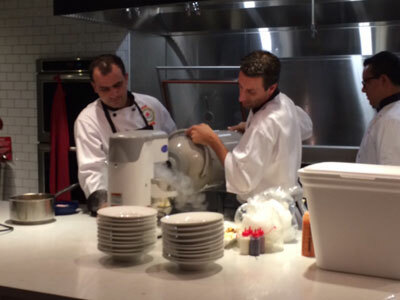 The chefs prepared dessert using liquid nitrogen! 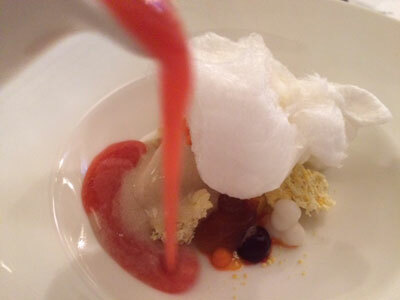 The nitrogen was used to make creamy rhubarb sorbet as well as icy beads of carrot juice. This along with some coconut sponge, yogurt foam and cotton candy made for a flavourful dessert with lots of textures. 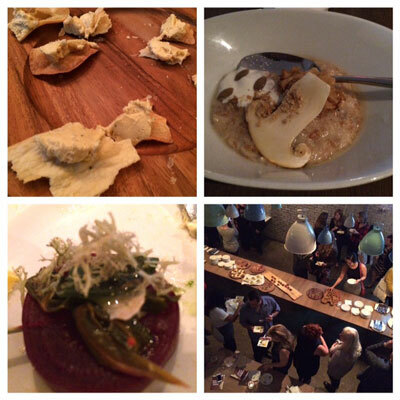 It was a fantastic evening, combining a couple of my favourite things – beef and Mexico! 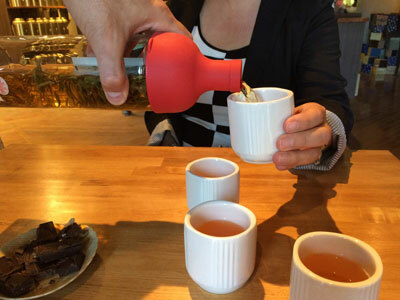 I was thrilled to finally take part in a food tour a couple months ago. It was so amazing, I’ve been raving about it since. 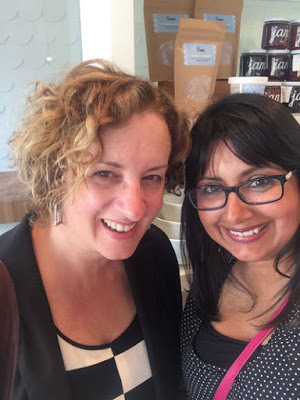 My friend Karen Anderson, the nicest person you will ever meet, started Calgary Food Tours in 2006. The tours take place through different neighbourhoods around the city (as well as some markets) while the tour guides share their passion for food along with some history. 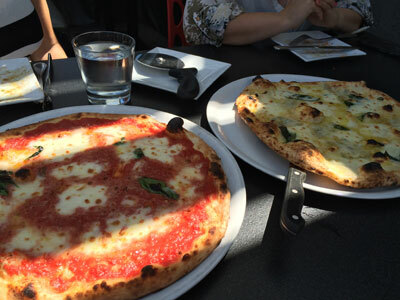 The tour that I took was Craving Kensington which included two blocks of deliciousness in the neighbourhood of Kensington. 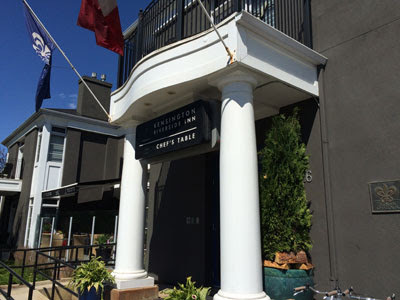 The tour started at the beautiful Kensington Riverside Inn. Our tour guide Jenny filled us in on some interesting history of both Calgary and Kensington. Having been born and raised in Calgary, I was a little embarrassed that I didn’t know a lot of the information that I learned that day. 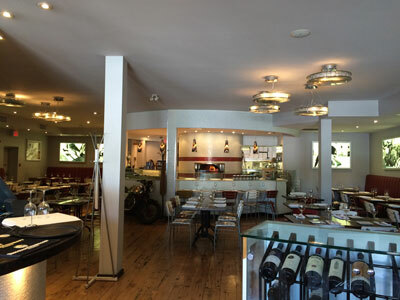 Next stop was lunch at Pulcinella. 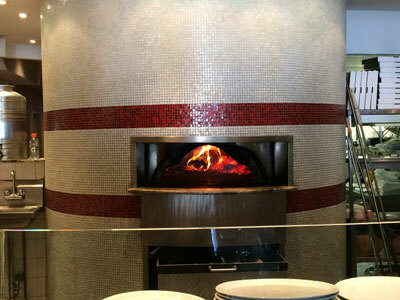 This gorgeous 2-story restaurant is family run and serves delicious Neopolitan pizza cooked in a wood burning oven from Naples. 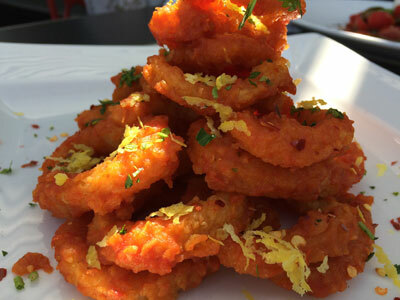 We started with crispy calamari and a tomato salad with creamy burrata. This was then followed by a couple of thin crust pizzas. A lot of food for four people! Following our Italian lunch, we went to The Naked Leaf and had a little tutorial and tasting. 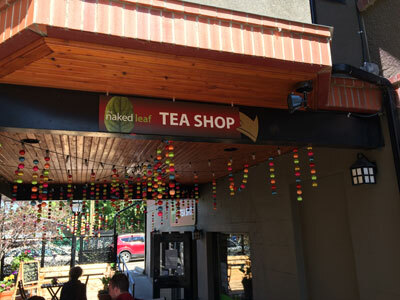 The store boasts many organic teas as well as an amazing patio to enjoy the drinks on. 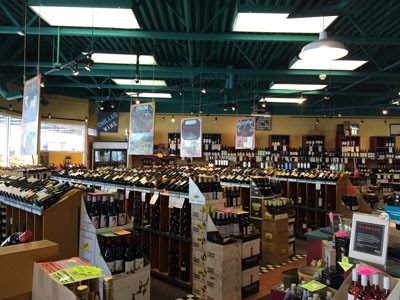 Wine lovers rejoice – there’s a stop at the Kensington Wine Market! 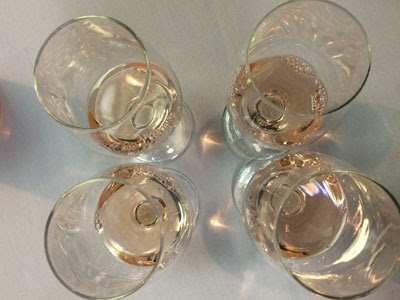 The staff here are happy to share their knowledge and a glass or two of their favourites. 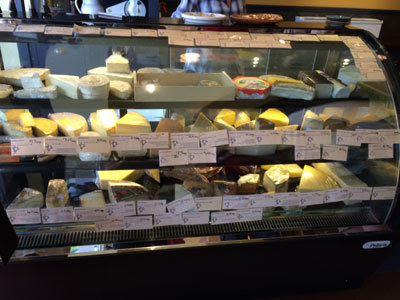 We moved along next to the Peasant Cheese Shop and tried out a few of their many cheeses. 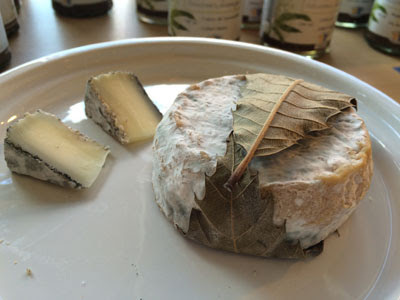 While there, you can also pick up some accompaniments like crackers, preserves and charcuterie. It’s a good thing we were doing a little bit of walking because our next stop was more food. 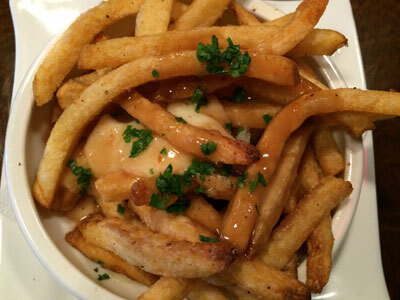 We stopped at Brasserie Kensington for some of their poutine. The fries were perfect topped with cheese curds and duck gravy. Definitely going back again for that! We ended the tour on a sweet note – at Crave. 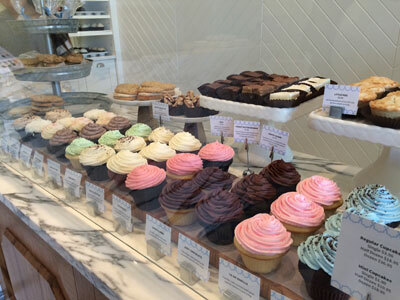 We were able to tour their newly renovated store and we learned how to do their trademark swirl. We were able to practice hands on so that was fun. Of course, sampling was involved. 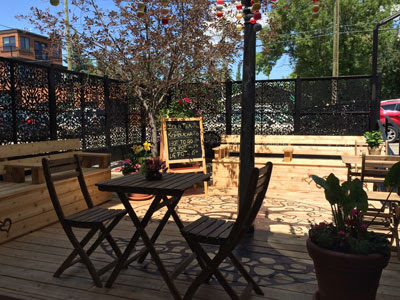 If you ever get a chance, definitely try out one of the tours offered by Calgary Food Tours. It was a fun afternoon and I left with a full stomach and so much knowledge!